Mercedes-AMG has been working on the AMG GT 4-door sedan for a while now. Recently yet another test mule of the car was spotted, possibly undergoing the final stages of testing before its official debut. While the new Mercedes-AMG GT sedan a.k.a. the GT4 is expected to make its debut at the upcoming North American International Auto Show 2018, in Detroit. 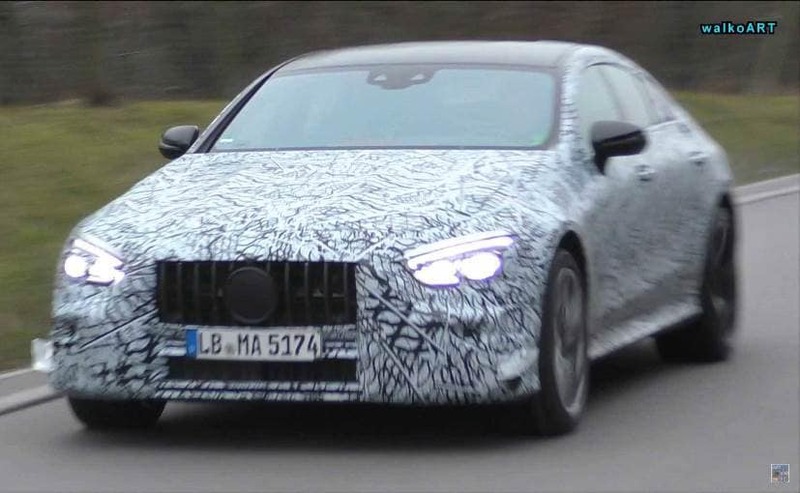 Having said that, looking at all the heavy camouflage on this test mule, it is possible that Mercedes-Benzmight reveal the car a little later, possibly at the Geneva Auto Show 2018. Now the, despite the heavy camouflage we can see that the car is pretty much production-ready. Right from the signature Panamericana grille and the full-LED headlamps with eyebrow-like daytime running lamps, to the horizontal LED taillamps and the quad-exhaust setup, the car is equipped with production parts. The matte black alloys are the same ones we saw on the previous test mule that was caught testing. The coupe-like roofline is consistent with the AMG GT family with the stubby tail. In fact, the new Mercedes-AMG GT four-door sedan will also be a spiritual successor to the CLS 63 AMG. While we do not see the cabin in these images, we did share an image of a heavily camouflaged cabin in our previous report. 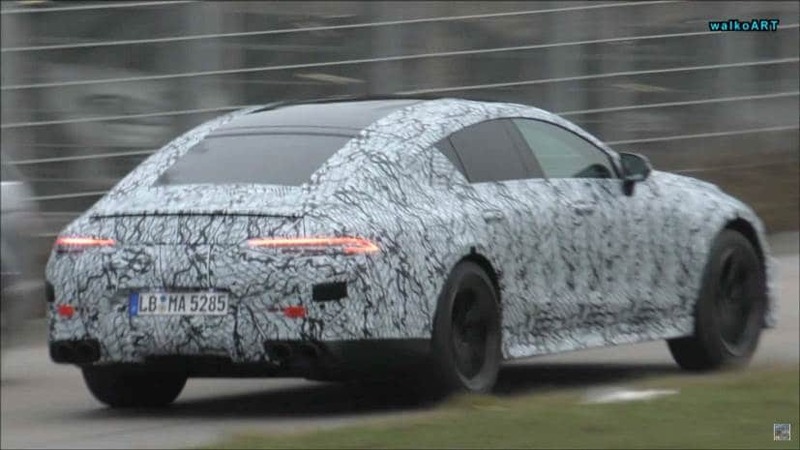 We had also mentioned that despite joining the AMG GT family, the four-door performance sedan will be based on the new-gen Mercedes-Benz E-Class sedan and likely to borrow some of its styling cues and features, especially the cabin. Powering the Mercedes-AMG GT four-door sedan will be the existing 4.0-liter bi-turbo V8 engine that is offered with AMG GT models. 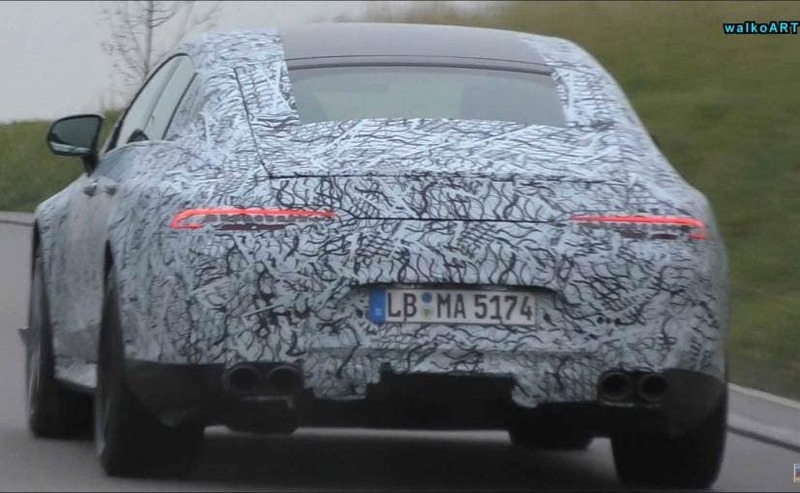 However, the engine will be tuned differently for the AMG GT sedan. In the standard sports coupe model, the motor makes about 510 horses along with a maximum torque of 650 Nm. Having said that, the concept version showcased used a hybrid powertrain with about 800 bhp on offer, but the production model will get this powertrain a bit later after the launch.